Looking around my local gym during a recent visit, I noticed that there seem to be three kinds of gym member: – a minority of people who clearly enjoy it and give it 100 per cent; the guys who would rather be somewhere else but who know that they have to make an effort for the visit to be worthwhile; and the individuals who do not want to be there and who can’t be bothered to try. The final group are most evident at the beginning of the year, but normally throw in the towel by February. 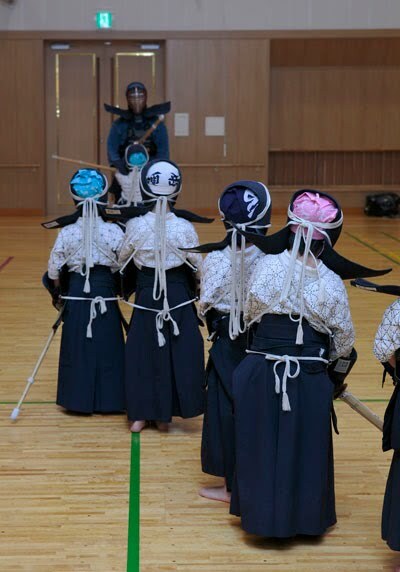 Kendoka seem to have a different perspective and fall into two categories: – those who try desperately to improve; and those who enjoy their keiko for its own sake and are quite happy to come back and perform to the same level week after week. Now with the kangeiko season at its height and people starting back after the holiday layoff, it is even more obvious that the ambitious group and their laid-back colleagues take a different approach to New Year training. For instructors it is difficult to run classes that both stretch the motivated and inspire the lazy. Too much hard kihon geiko and the less fit kendoka become tired and discouraged. On the other hand if a session is devoted exclusively to peer level jigeiko, it is easy to find your own comfort level and not try to stretch. In many dojo outside Japan practice sessions tend to last for two hours, where in Japanese ippan-dojo keiko normally lasts for an hour, so there is also a tendency to save energy in order to last longer. In my view keiko should be short, hard and regular. The other difference is that in dojo where practice is based on shido geiko or motodachi geiko, junior members have the chance to catch their breath whilst waiting to practice with teachers or seniors; who through their experience and knowledge are able to push them on without completely exhausting them. With mawarigeiko, which seems to be the most common form of practice where grades are more evenly distributed; it is more likely that people will coast to last the distance. If mawarigeko consists entirely of jigeiko, then bad habits come to the fore when we try to win at all costs. My favourite approach to mawarigeiko is to combine kihon practice and jigeiko. So for the first three or four practices everyone starts with kirikaeshi then moves on to a short jigeiko with the same partner. After each we change partners and move through repetitions of waza geiko, transitioning to jigeiko with each opponent. So a one hour session would include kirikaeshi /jigeiko, men uchikomi / jigeiko, kote uchikomi / jigeiko, dou uchikomi /jigeiko and then on to combining nidan waza and finally uchikomigeiko and kakarigeiko. In this way, as well as including basic practice, we are thinking about using correct technique in the jigeiko sessions. Doing it this way, we are also more motivated to helping our partners improve, rather than being content to steal a few crafty ippon. So hopefully the ambitious kendoka get to improve and to bring their more easily pleased friends along with them.